GENEVA - U.N. war crimes investigators called on Israel on Monday to stop its snipers using lethal force against protesters on the border with Gaza, as the anniversary approached of the start of demonstrations there last year in which 189 Palestinians were killed. 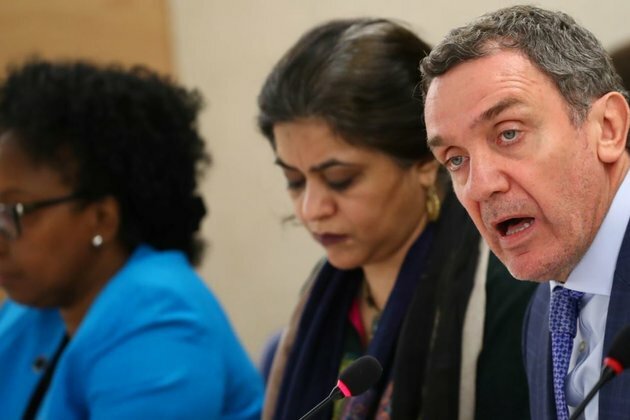 'The most important thing for the government of Israel is to review the rules of engagement immediately and to ensure that the rules of engagement are according to accepted international law standards,' the commission's chairman Santiago Canton told the Human Rights Council. 'The moment has come to say loud and clear @UNHumanRights @UN_HRC are complicit to the Hamas terror campaign against Israel,' its foreign ministry spokesman Emmanuel Nahshon said in a tweet. Israel's main ally, the United States, quit the 47-member U.N. Human Rights Council last year, also accusing it of an anti-Israel slant. 'To pass resolution after resolution on Israel while frequently ignoring China, Cuba, or Russia, is a horrendous hypocrisy,' U.S. ambassador to Germany Richard Grenell told the crowd of Israel supporters gathered outside the UN in Geneva. 'Applying one standard to the state of Israel and not applying the same standard to others is anti-Semitic,' he said. U.N. special rapporteur Michael Lynk said Israel 'continues full-steam with settlement expansion' in the West Bank, which the United Nations and many countries deem illegal. There were 20,000-25,000 new settlers a year, he said.